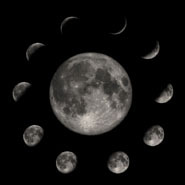 February’s moon is known as the Storm moon and sometimes the Death moon. Which makes sense. February is cold and harsh, and the days are short. To the Wiccan, its a time for cleaning out the clutter in your house and preparing herb beds for new seeds. It’s also a good time to dump any emotional baggage you might be dragging around.